The desire to have someone’s signature never seems to go away, whether it’s on a scrap of paper, a CD cover, or wherever – even on a guitar. But autographs of the 1990s music stars tend to sell for a lot less than their earlier counterparts. In part that might be because the cult of celebrity has reached the point where we already feel we know our idols well. They’re written about so often, every move noted, that it’s actually hard to escape them. Another factor might well be that, in most cases, the fans are unwilling to pay the prices many dealers require for 90s stars. The big question, of course, is whose autographs are likely to become valuable in the future. The simple answer is the more “classic” rock acts like Oasis, U2, Nirvana and REM. Certainly; this would be the time to buy. 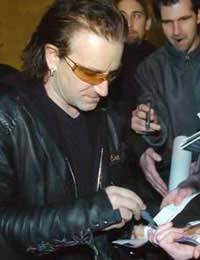 You can find U2 signatures ranging from £125-250, more or less, REM for similar prices and Oasis often for a little less. The one that stands out, however, is Nirvana, whose autographs, especially for the late Kurt Cobain, sell for much higher prices, up to £1,000 for full band signatures. They’re the ones likely to increase most – and quickest, which can sometimes be an important point for investors. With the “approval” of writers and other artists, these are the lauded acts of the period. But what about the pop stars? There were enough of them during the decade, after all. If you’re looking for a Robbie Williams signature, very nicely presented, matted and framed, you can find them, ranging from around £170 up to £250. The American divas, like Britney Spears and Mariah Carey, can’t compete for price with that, although a matted and framed Britney autograph was offered at £200. Mariah, on the other hand, was being offered at a mere £100 for a signed CD cover. For now, at least, many 90s autographs are very much the province of the fan. Maybe that’s for the best, overall, since serious collectors can’t take over everything yet! The fans need items they can afford. eBay is an ideal market for more recent autographs, although, obviously, you need to take the usual precautions to make sure the items are authentic (which you’ll need in order to re-sell later, anyway) and you also need to be very aware of market prices. Don’t overbid on items – one thing you can almost guarantee is that, with autographs, there will be more offered. You can buy from dealers, but be aware that their items tend to be as much about presentation as the signature itself, in order for them to charge more. If that’s what interests you, fine; otherwise you’re simply going to pay over the odds for an item whose resale value won’t be as high as you hope. By the time autographs graduate to auction houses, of course, you’ve left it too late. You need to be ahead of that curve if you’re looking at making real money from memorabilia as an investment.